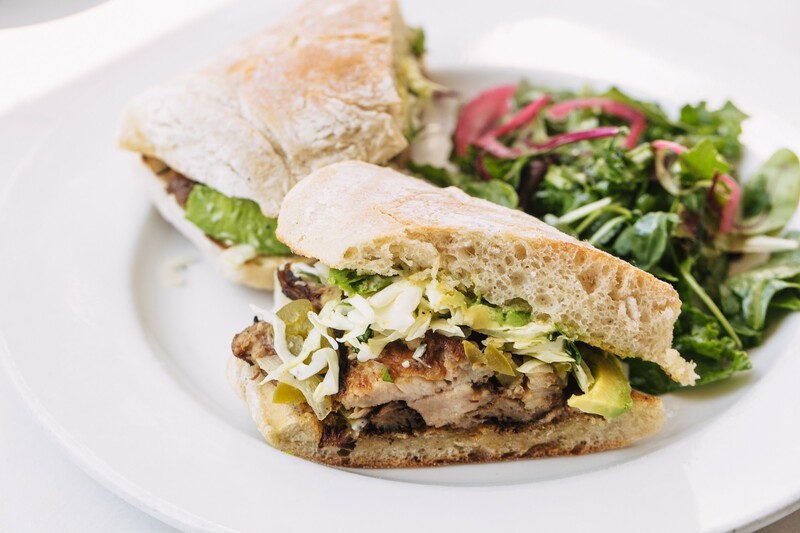 Howden does sandwiches right: The pork confit with avocado was decadent and delicious. These are confusing times on the corner of 17th and Webster streets in Oakland. Bear with me here. There's a bit to explain. For 10 years it's been home to Spice Monkey, a neighborhood staple serving pan-Asian dishes in a gorgeous, historic building. Last year, owner Kanitha Matoury launched Howden Market next door, a charming shop stocked with organic, gluten-free, and vegan products. And three months ago, she transformed Spice Monkey into Howden Restaurant & Bar, with a new, high-profile chef on board. The name is an homage to the building's history, once the Robert Howden & Sons tile factory, as well as an attempt to unify the space. Matoury envisions folks in the neighborhood meeting each other while shopping at the market and then bonding over drinks at the restaurant bar. "It takes a lot more than making great food to build community," she said. Matoury's goal has always been to bring the community together. That's why Spice Monkey has long hosted comedy shows on the weekends. It's why Matoury is working on building a parklet out front. And it's why she briefly closed Spice Monkey earlier this year, remodeling the dining room so it feels more like a relaxed, bites-with-drinks place with counter service. She sensed the shifting demographics of the neighborhood: Younger residents kept coming in with busier schedules and a preference for casual settings. But for the past few years, Matoury has had a tough time finding chefs who align with her vision. She stepped away from the kitchen three years ago while she focused on her real estate business and launching her own spice company. But none of the chefs she asked to cook her menus worked out. With the rebrand, she recruited her longtime friend and mentor, Jesse Branstetter, to join her team and gave him lots of creative leeway. Branstetter is best known as the founding chef at Chop Bar. He opened his own short-lived Oakland restaurant 1015 Clay, briefly cooked at Vitus, and was a driving force at Cafe Q in Alameda, which is also closed. Branstetter has changed the menu dramatically since the Spice Monkey days. It's even more eclectic, with global influences and the meaty, comforting sandwiches Branstetter has been known for. The ancho-braised brisket sandwich, paired with an herby aioli and salsa verde, was excellent. I also enjoyed the pork confit — fatty with crispy edges — made even more decadent with avocado. With both sandwiches, the bread from Firebrand Artisan Breads performed beautifully. Branstetter's popular grilled yam-and-cheese is carried over from his previous ventures. With goat cheese and poblano aioli, it's a hearty vegetarian option on an otherwise meaty lunch menu. 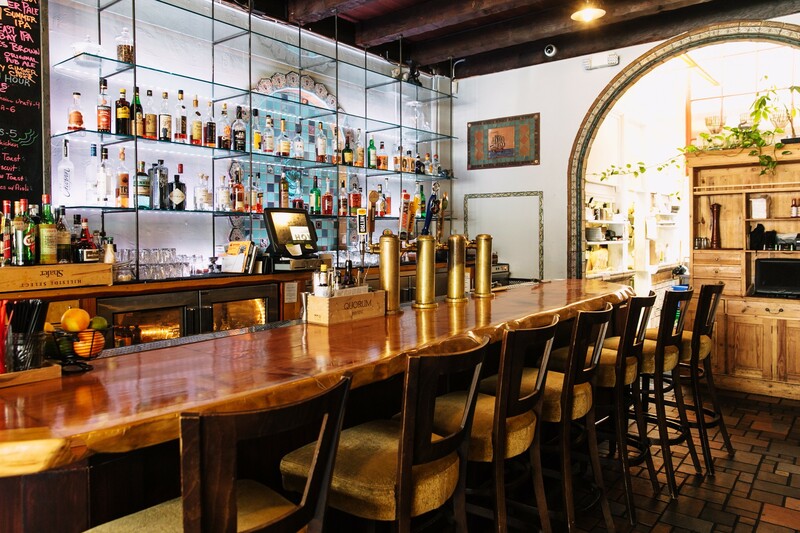 The space is a lovely blend of art deco and Mediterranean aesthetics. On my afternoon visit, the Cambodian steak salad was also available — a holdover from Spice Monkey and one of the late restaurant's most popular dishes. I liked the combination of peppery steak, tomato, greens, and crispy vermicelli threads, but the garlic-lime dressing needed more acidity. However, Branstetter took the item off the menu shortly after. And Matoury doesn't seem happy about it — understandably so, given it's her grandmother's recipe. For now, Branstetter and Matoury don't seem to be on the same page. Matoury admitted she "retired Spice Monkey" but also wants to make sure her regular customers can still get their favorites, such as the steak salad. She pointed out how the window reads, "Howden, Home of the Spice Monkey," even though that name doesn't appear anywhere else. Meanwhile, Branstetter sees Howden as a totally separate entity, with Matoury's spice blends being the only continuation of Spice Monkey. Unfortunately for customers, that miscommunication is felt in the dining room. On my first visit, one of Howden's employees actually gave us full table service — even though she evidently wasn't supposed to — and suggested that Howden was merely a rebranded, remodeled Spice Monkey. For dinner the following week, the bartender insisted on counter service — even though the place was empty — and told me Howden was a brand new restaurant. That confusion wouldn't really matter if the food was on point. While lunch worked in Branstetter's favor, dinner was a bland, uninspired mess. Despite the short menu, Branstetter tries to incorporate too many flavors and winds up not really incorporating any. There's Mediterranean hummus, Vietnamese meatballs, Belizean salbutes, French ratatouille, Middle Eastern lamb kefta, and an all-American burger — well, except when the restaurant is out. At 6 p.m., I was amazed how quickly my options dwindled. The kefta was gone, as were the meatballs. There weren't any black beans for the salbutes. The light beer option was tapped. At 6 p.m.! The bartender offered to top the salbutes with chicken instead. The texture of the puffy masa cakes worked well against creamy avocado — and, I'd imagine, black beans — but the chicken was so dry my dining partner thought it was jerky. Still, it fared better than the tough, flavorless ribs. Branstetter says he braises them in white wine, orange juice, and all kinds of lovely aromatics, but none of that came through. They sat on top of wasabi-flavored mashed potatoes as if it were 1998. I was similarly shocked to find the burger strictly mediocre, given Branstetter's habit-forming work with beef patties at Chop Bar and Cafe Q. The biggest successes were the simple but well-prepared market chop salad, with creamy feta, olives, and strips of salami; and the vegetarian entrée, a coconut curry with sweet potatoes, bok choy, and leafy greens over brown rice. Despite being the tastiest dish of the night, the curry's $16 price tag and small portion still puzzled me. At the end of the meal, my tablemates — all fans of Branstetter — sat in uneasy silence. What the hell happened? We took refuge in the environment, a lovely and unique blend of art deco and Mediterranean aesthetics. We marveled at the stone fireplace, the stained-glass, and the festive tiling and mused aloud about returning — for a drink. Clearly, the transition from Spice Monkey to Howden is ongoing and bumpy. But I believe in Matoury's passion for the community as well as Branstetter's talent in the kitchen, so hopefully, Howden will soon emerge in a better place. Matoury acknowledged that the restaurant isn't operating as well as it should, and that's the first step toward improvement.